I'm struggling to bottom a problem with a sooty or perhaps oily plug in cylinder 3. I started out with this '81 1100 that hadn't run much for 2 years, it ran really badly, but I was told the carbs had been 'done.' Couldn't run the bike without near full choke, so I had the carbs apart. Varnish, dirt, accelerator circuits didn't work, the usual suspects. Perished air cuts offs, one of which had been 'repaired' with silicone sealant (which struck me as utterly ridiculous). Coudln't get carb cleaner through some of the jets. Right state. Now carbs sorted, bench synched, floats adjusted from 19-21mm to 15.5mm (how so wrong?) 4 x new cut offs installed, fuel screws set at 1 1/4 out from their previous setting of 3 5/8 (which also struck me as ridiculous). Bike fires up nicely, comes of choke quickly, vacuum synch done (pictured), idles at an indicated 1100ish (it sounds right, any lower and it sounds like it's hard work), and over the last 5 rides I've been adjusting the fuel screws from their stock setting. From the outset plug 1 looked OK. Plug 3 was oily/sooty, plug needed a little more idle fuel, and plug 4 was looking lean. 1,2,4 all look about the same now, but 3 just won't change. I've almost shut off the idle jet now, and it's still black. As an aside, the bike rides nicely (new to me, so I'm learning how it feels as I go) acceleration winds on nicely, the transmission whine is totally addictive hard on the gas. If anything I have to work the clutch more than I thought I might on this bike, to stop it bogging a little as I take off; it doesn't seem to have the torque pull I expected, not even like my Daytona 900. It's returning 41 mpg (UK gallon. 9 miles per litre).If anything it's a bit vibey above 65, and needs a 6th gear. But it's all about getting the carbs as good as I can at the moment. Hope someone has an idea. I'm going to shut down the idle jet on 3 before I ride home today, and see what happens, then I'll open it a touch before I set off. and check that plug again when I get home. This is interesting, ish, the heat difference between the exhausts. The actual colour between the 2 sides is not relevant as I had the FLIR focussed at different spot, so it uses an arbitrary scale. But the fact that exhaust 3 is so much cooler than the others is what makes me think there's lots more charge in there keeping it wet, hence cool. I know 3 is sparking and firing, because the bike runs OK, and runs badly if plug cap 3 is pulled off (which I believe is unadvisable). Just a bit of interesting info I thought. Last edited by UrbanPeasant on Mon Apr 08, 2019 8:02 am, edited 2 times in total. Murphy's Law, just landed on this thread - Spark Plugs fouling out - so I'll look into the posts there. Pretty confident I've not got a stuck float as it wasn't flooding on the bench with a good head of fuel. It's not burning oil and chucking it out the tail pipes. I'll need to buy a high compression tester. Slide stuck open - surely that'd interfere with running on the road, and running seems fine. Bear in mind that the mixture screw only affects mixture at idle. If it's making no difference to the idle mixture (try using a Gunsons Colortune to 'see' the mixture), is the end of that screw broken off? It may be worth removing the carb tops and checking the slide needles, to see if a PO has put a washer under the needle to raise it slightly to give a richer mixture. No washer, I've had the needles out. I did try the washer on some other 1100 carbs though, and found that if tightened the lock plug down in the tube, like it was with no washer, then it stops the needle moving and locks it solid. So I reversed that idea on those carbs, and carried on as normal. The idle fuel is there all the time though, so too much at idle is too much everywhere else too as it's always drawing that fuel out of the bowl. The idle is decent, which is why I'll try to upset it on 3 before heading home today. I'll look for a Colourtune. My Dad might have one lying around so I'll ask first before opening my wallet. Bad plug? Probably not because I've already cycled the plugs around the 4 cylinders, and whichever plug ends up in there, ends up black. I should've mentioned that I'd done that in the original post. Thanks for the suggestion though. I hadn't come at it from a bad plug angle, I'd come at it from a 'does any plug I put in there end up black?' angle. Just to see what happens, without realising that I was testing for a bad plug in doing that. Thinking from another angle, it may not be too much fuel, it may be not enough air. Are all the air passages clear? Is the new air cut-off valve on that carb working OK? Maz, how do I tell? It's a new cut off valve/spring/o-ring, and the passages are clear in the carb body that sit behind that valve. No doubting that (says the man who doesn't know why his carbs appear not to be working quite right). There seem to be 3 passages per cut off, plus the really tiny one in the screwed down cap. At the time I put the carbs back together 10 days ago, those passages were fine for sure, but that plug has been black right from the start. If you've blown air through all those little holes and you can hear it escaping in the carb body, then I would say they're clear. When you fitted the new cut off's, did you press the metal centre of each one (when in situ, but before fitting the spring and cap)? You should be able to push it in and it will spring back out when you let go. I'm kinda thinking out loud for you here. As you spotted, I have a 1000 not 1100 and the carbs are different (only one cut off valve for a start!). Hopefully, some of the 1100 owners will chime in. I forgot to ask, did you remove the mixture screw to check that the end hasn't broken off? Air cut off springs, sat into the centre of the cup they sit in as I put things back together. But you've asked the question so I'll have to check. The fuel screw needles were all fine; not bent (like in my other rack) and not broken. I'd be very surprised (and somewhat heart broken) if I broke No.3 screw putting it back in. I'm no heavy-handed clown. But things do happen. This evening I wound No.3 screw all the way in once I was back, and it didn't interrupt the idle at all, but it did seem to help throttle response. I'll know that for sure tomorrow. I've actually left it a little less than half a turn open now, and have wound the idle speed down to 1000 (indicated) and it still sounds fine, not laboured like it had been at 1000 previously. Will ride to work again tomorrow and see how things are. Might shut it down further. I took a 15 sec video so folks could hear how steady the idle is. Just a shame there's a fly in the ..... fuel. What I notice with the heat camera (it's a CAT S60 android phone - basically useless for everything, expect heat imaging, but tops out at 150 celcius) is that the inboard side of No.3 exhaust is hot, but the outboard side, seen earlier, is cold. Confirms it's firing, but not much more. Basically, fancy pictures giving a heat insight aside, there's no escaping the carbs coming off again; no other way. Bought a compression tester, should be with me in a couple of days. The fact that the plug seems oily is presently leading me in that direction, though I guess fuel+soot might seem oily too, and I wouldn't be one well enough versed to be able to spot the difference at present. If it's black and wet, usually oil fouling. Black and dry, fuel fouling (rich). the next time the carbs are off for oil seeping in from a worn valve stem seals. Also since #3 carb has the fuel inlet barb for all 4, maybe setting the float a little lower may help it control fuel flow in to the carb better. (just guessing here) Another thing is the accelerator pump lever could be bent and not let the accelerator pump actuating rod have any clearance/play at idle. If the compression test comes out good and there is no oil leaking in from the valve stem seals I would try another #3 carb. Will hopefully have the compression tester tomorrow. In the meantime, the valve stem oil seals are below the carb-cylinder head venturi, so are you thinking that if an oil seal is failing I'll see that escaping oil on the sides of the venturi - blown (or sucked) upwards? I should be able to check that without taking the rack off, I'll just prise that tube off. I haven't seen any evidence of the VSOS being changed, and I do have the full history of the bike. So it's not beyond the realms of possibility that there is a failure there. Wouldn't failing VSOS also manifest as a smoky exhaust too, or would it not be enough oil to notice visibly? I see what you're saying about the float level. It's at 15.5mm at present, and know it's sealing because my bench test with a good head of fuel showed no leak (I did have a stuck shut-off prior to the current rebuild and fuel gushed up out of the main jet. I wondered what was wrong until the realisation hit me. By which time I had a bench covered in fuel). So I could make it seal sooner, like 16.5mm. I can't really think of much worse than having to go through a period of trial-and-error to get float height(s) adjusted right if they're going to end up being anything other than standard. Awful job - worse than making a film out of Plasticine models (Wallace and Grommit). The comment is noted though, thank you. I do have a spare, clean No.3 carb, so that is a possibility too. Just my opinion, but stick to the specified float heights for all 4 carbs. They are designed to work at 15.5mm. Anything else would be introducing a problem. At best you would be trying to mask a problem by doing this. It may help to check out the Wingovations website. 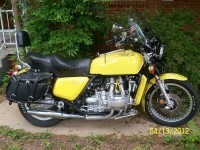 Masses of tips and knowledge on there from John Evans, who is, in my opinion, THE guru for Goldwing carbs in the UK. He is on this site as Old Fogey. In the exhaust if the leak is substantial. You will need to remove the intake tube from #3 in order to look directly at the intake port on the head, a flashlight will help. Chance you will see carbon buildup in the back of the intake valve and maybe oil seeping in to the intake. Use a heat gun to make the rubber connector come off easier from the carburetor. My 81 GL1100 needs VSOS yet it does not smoke, but it will blow a nice puff of smoke every now and then. It does have excessive carbon buildup on the back of the offending intake valve and it does leak oil in to the intake valve port from the stem. As of late I am seriously considering removing the heads and do a valve job. Hey there is no doubt it needs it just on how old the bike is. Also you can check the valves for leaks by adding some compressed air to the cylinders and listen for leaks. Slight delay in the time taken to get the compression tester to me, so in the mean time I drained, flushed and filled the final drive. What came out was all wrong. I'm hoping the clean out will stop the leaking I was suffering from via the air breather. Indexed the plugs to pass the time too. Compression tester arrived yesterday, did the test tonight and all 3 cylinders read dead-on 105psi (good fast cranking battery, air filter off, throttle wide open, engine warm to hot) which seems low, but the bike runs nicely so I'm not sure I need to do anything about that. Sat and chatted with the old boy I got the bike off (he bought it new in '81) the heads were reconditioned less than 1300 miles ago, new VSOS, valves lapped in, new gaskets, not sure what else. Carbs are off, No.3 is in bits. Maz you asked about the spring on the air cut off - it was seated correctly, the little seal was in place, the diaphragm is only a couple of weeks old and is in good condition, the passageways around the cut-off are all clear. The fuel screw is in good condition, not bent, and the passageway is clear. At the time of taking it out to check it, it was 2/3 turn out from bottom. The float is at 15.5mm and doesn't appear to stick. The piston in the vacuum cap moves freely, bouncing on the spring. "If the spark and compression are OK,It must be fuel supply to the cylinder. Perhaps a mis-adjusted carb, stuck float or vacuum slide stuck wide open." Looks like the culprit is the post that the piston slides up and down on, or the brass guide in the vacuum cap (or both) because I can't see or feel anything wrong with the smooth surface inside the cap, or the piston surface that meets it. Hi Tom, thanks for looking, and for noticing! That was a typo I hadn't spotted - should have read '4'. I didn't miss one. And I agree on the low psi comment, though only from watching many many episodes of Wheeler Dealers where compression is tested on some car or other, and always seems to come up around that 150psi mark. But they're all exactly the same at 105, and the bike seems to run nicely, so I'm not sure there's a problem. Perhaps another tester would yield different results? After dealing with the sticking No.3 piston/vacuum slide, I took a couple of photos down the intakes before putting the carbs back on, as that had been suggested earlier as a way of noticing a leaking VSOS. Both inlet valve intakes look the same. So I've had nice ride about this morning in the sunshine and got back to pull the plugs, hoping that I'd see that No.3 was now much like the others having dealt with that sticking piston. Wrong. Still black and wet. In the plugs photo, from the left, 1,3,2,4. And using the thermal imager again, exhaust header No.3 is still cold with respect to the others. I think you may be correct, in that a different compression gauge may yield different results. Just to confirm though, you are holding the throttle wide open when doing the compression tests? This WILL make a difference. If the black residue on that plug was oil, I would expect to see quite a bit of blue smoke from the exhaust, which you are not seeing, so I am still leaning towards a rich mixture. Seeing as you are in the uk, if you would like to try a Colortune to check the mixtures, rather than buying one, I would be happy to send you mine, on loan, and you could send it back when you're done. PM me to discuss if you like.